Cake mixes take the drudgery out of meticulously measuring ingredients for cookies made from scratch. Nearly everything you need is already in the mix making this a speedy process indeed. It's also ideal for a first-time baking project with the kids. When they've mastered the limited measuring, mixing, scooping or rolling involved, you can move on to from-scratch cookies. But these are so tasty, you might prefer them instead. For these recipes, a cake mix that produces a two-layer cake is required. There's something so decadent about a recipe with "double chocolate" in the name and these scoopable cookies deliver. Heat oven to 350 degrees. Line cookie sheets with parchment paper or lightly coat with cooking spray. Pour the chocolate cake mix in a large bowl or stand mixer. Add egg and butter. Mix thoroughly until a ball forms. Fold mini semisweet chocolate chips in until combined. Using a cookie scoop, place dough on prepared cookie sheets spacing 2 inches apart. For chewy cookies, bake 7 minutes. For crispy cookies, bake 10 minutes. Remove from oven and let cool 5 minutes on pan before removing cookies to a wire rack to cool completely. Store tightly covered. Substituting different chocolates for the semisweet chips and adding nuts make this a really special dessert offering. Use white-chocolate or chocolate-mint chips in place of the semisweet chips. Add 1/2 cup chopped pecans, walnuts, or macadamia nuts or sliced almonds. 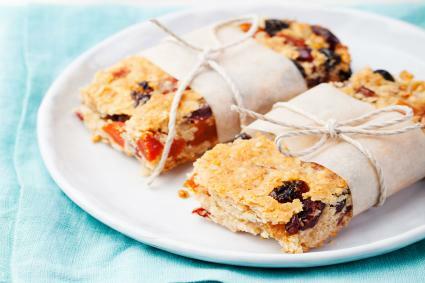 Turn a yellow cake mix into chewy, moist bar cookies by adding chopped dried apricots, cranberries, and nuts. 1 (16.5-ounce) package yellow cake mix with pudding in the mix or labeled "moist"
Heat oven to 350 degrees F. Line with parchment paper or lightly coat with cooking spray a 13x9-inch pan. In a stand mixer or large bowl, mix together cake mix, brown sugar, and cinnamon until well incorporated. Add butter and eggs and mix until combined. Stir in by hand the apricots, cranberries and walnuts. Transfer to prepared baking pan, spreading evenly. Bake for 35 to 40 minutes until edges turn brown. Remove from oven, cool 10 minutes, then run a knife around edges of pan to loosen sides. Transfer to a wire rack to cool for 1 hour. Sprinkle with optional confectioners' sugar and cut into 12 to 16 bar cookies. This recipe lends itself to experimentation since the dried fruit and nuts can be varied according to your taste. Instead of using dried apricots, dried cranberries, and pecans, try substituting dates, raisins, and walnuts or dried mango, dried pineapple, and macadamia nuts. With all the busy work involved in holiday entertaining, using cake mix to speed up the process of making rolled gingerbread cookies is a stroke of genius. Heat oven to 325 degrees F. Have several cookie sheet pans at the ready. In a stand mixer or large bowl, thoroughly combine spice cake mix, flour, eggs, oil, molasses, and ginger. The dough will be soft and that is OK. Wrap in plastic and refrigerate for 2 hours. Cut parchment paper to fit the cookie sheet pans but do not put it on the pans. Remove the dough from the refrigerator and cut in half. Rewrap the second half and place back in the refrigerator until ready to use. Working with one piece of dough at a time, roll the dough directly on the parchment paper, but not on the sheet pan, to prevent warping of shapes. Using cookie cutters or templates of similar size so they will bake evenly, cut desired shapes spaced 3 inches apart. Remove excess dough and set aside to be rerolled for more cookies. Lifting by opposite corners, transfer the parchment paper to a cookie sheet. Depending on the size of the shapes, bake 8 to 10 minutes or until edges just start to brown. Remove from oven and place pan on a wire rack. Cool cookies completely on the pan before attempting to remove them. Decorate cookies with white or tinted royal icing. 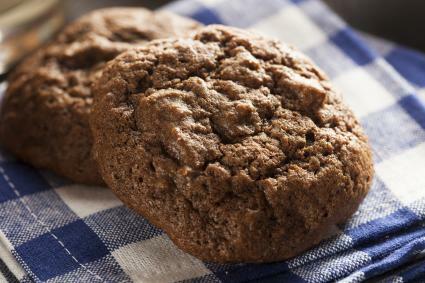 For a spicier, more aromatic cookie, add 1/4 teaspoon cloves, 1/4 teaspoon allspice, and 1/4 teaspoon cinnamon to the dough. However, these spices are already present in the spice cake mix so only add them if you like a bold flavor. 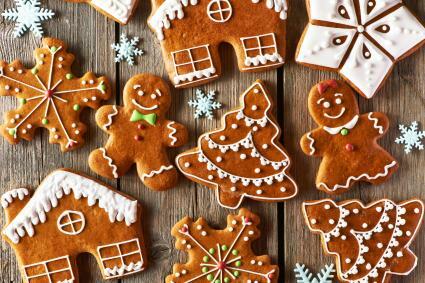 Instead of cutting the dough out in individual shapes, use the recipe to cut pieces to build a gingerbread house. For busy families, cookie recipes that deliver homemade results in half the time are a gift. Enter the cake mix that can be converted into a cookie by using, in general, less liquid. For success, it's important not to wing it. Use a recipe specially formulated to make the transition from cake to cookie a smooth one.